Loved it! What a dirty, cheating little man. Every time he slips into French, Italian or Latin, you just know he's had a sneaky encoutner with a woman who isn't his long-suffering wife! Typcially, she becomes a little friendly with her dance teacher and Sam's on the rampage! Really conjours up late C17th London. Great fun. Pepys' diary only covers 9.5 years, from 1st January 1660 when he was 26, to 31st May 1669 when he was having so much trouble with his eyes that he decided he couldn't write any more, but it still amounts to 9 volumes in the complete edition. 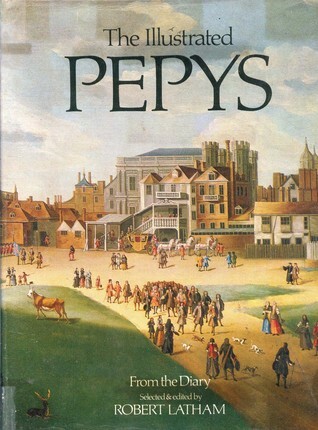 That makes this edition perfect for anybody who wouldn't want to read the whole diary but wants to get a flavour of Pepys's life and times.The great thing about Pepys is the way that he mixes the politics of his work with remarkably open confessions about the vagaries of his private life. He was an administrator for the Navy, and since the English were at war with the Dutch for some of this time, and the war was fought mostly at sea, he was often in contact with King Charles II and his closest advisers. The day that he is able to report (with great pride) that the King knows his name comes fairly early in the diary. He loves life too, and says more than once that the only reason for prospering is so that one can enjoy being 'merry' - which for him means having friends round for dinner, music, dancing and hilarity.The diary is probably best known for its eye-witness description of the great fire of London in September 1666, and Pepys's frankness about his extramarital affairs which are briefly recounted in a bizarre mixture of English, French and Spanish (although the diary was already written in shorthand for privacy). His attitude to his sins is very endearing: he obviously loves his 'poor wife' as he calls her, and is genuinely remorseful of his unfaithfulness: virtually every New Year he makes a resolution to have nothing more to do with his other women, but it usually only lasts a week or so before he's once again chasing after some actress, wife of a subordinate or one of the maids in his own household. One thing I didn't realise before (and found rather shocking) was that the women were not always willing, at least in the early days. He would struggle with them and once reports having badly sprained his hand subduing a woman who put up a fight. On the other hand, he doesn't necessarily go 'all the way', but is often satisfied with kissing and fondling them. When one maid is dismissed after he has been cavorting with her for several months, he reports with regret that he did not 'have her maidenhead' - although perhaps that was just for lack of opportunity!This is a lovely edition with 16 full-page colour photographs of portraits and cityscape paintings, and many more line drawings of buildings and contemporary scenes that help the reader to imagine what Pepys was seeing. The only downside of this edition is that there are no footnotes. Occasionally the editors insert a few lines to explain something about an event or person, but there's no translation of the foreign or obsolete words that Pepys uses. This does make it flow much better of course but you have to accept that you might not understand every word. Great insight into life at the time etc etc. Fleshed out my vague impressions of what the great fire and plague must have been like with day to day practicalities, and learning about the workings of the monarchy, parliament and navy (particularly during the Dutch war) from a similar perspective was unexpectedly interesting. This is balanced nicely by moments of slapstick comedy relief, such as Pepys setting fire to his wig on a candle behind him and wondering what the burning smell is. Good stuff.While I did find it fairly hard work at times, I'm glad I pressed on - it's fascinating to see inside someone's head in such detail and to see how relatable his thoughts are. Watching him attempting to excuse his many guilty pleasures is always entertaining - Pepys is a rude man. Overall though, his enthusiasm for life and how much of an interest he takes in pretty much everything is inspiring. This book lved up to its reputation as one of the finest diaries in the Englsh language. It is a glimpse of everyday life in late seventeenth century England, with an insider view of the royal court, and the building of the Royal Navy. Pepys was famously badly behaved, and his triumphs and amorous defeats are detailed here as well (originally in code). The most vivid episode for me was when, with the Great Fire of London, he buried his gold to save it, then had trouble finding it once again! It is, as the editor notes, a great pity that Pepys did not continue his diary. It would have been wondeful to have had an insider's view of the Glorious Revolution of 1688. I have the whole set of Samuel Pepys diaries plus this extracted version- the Robert Latham series and I enjoy it immensely. It's a great way to enjoy life in London in the 1660's and the advent of what we would recognize as a middle class person enjoying life in a metropolis with coffee houses and restaurants and investment opportunities as well as the opportunity for extra marital romance and scientific lectures. I started this awhile ago, set it aside, and have returned again, with pleasure. If you'd like a first-hand and often humorous glimpse into life in the 17th century, you'll enjoy getting to know Samuel Pepys. This is a private journal from the mid 1600s of an upper level Navy administrator from his late 20s to his mid 30s. It's interesting to see a "real world" glimpse back in time. It was made more interesting since he was writing during the plague and the fire of London. The more we change, the more we stay the same. Samuel Pepys Robert Latham - Samuel Pepys was an English naval administrator and Member of Parliament, who is now most famous for his diary. Although Pepys had no maritime experience, he rose by patronage, hard work and his talent for administration, to be the Chief Secretary to the Admiralty under King James II. His influence and reforms at the Admiralty were important in the early professionalization of the Royal Navy.The detailed private diary he kept during 1660–1669 was first published in the nineteenth century, and is one of the most important primary sources for the English Restoration period. It provides a combination of personal revelation and eyewitness accounts of great events, such as the Great Plague of London, the Second Dutch War and the Great Fire of London.His surname is usually pronounced /'pi:ps/ ('peeps').